We ordinarily think of ourselves as either being awake or asleep, our minds being either on or off. We include dreaming as a part of the sleep state. But the situation is actually more complex, and to get at the heart of the sleep problem, we need to take a closer look. There are actually four states we need to deal with. Dreaming needs to be defined as a separate state and is referred to as REM, which stands for rapid eye movement because the eyes move rapidly from side to side while we dream. The other two states are transitions. Hypnagogia is the term used for transitioning from being awake to being asleep. Hypnopompia is the term used for transitioning from REM to being awake. Figure 2-1 is a representation of what happens during a normal night’s sleep. We all experience these states every night, although we might not have spent much time considering them. The mind also goes through several levels, termed stages, of deepening sleep during what we think of as our normal eight-hour sleep period. Scientists discovered these stages by recording brain electrical activity using an electroencephalogram (EEG). As you can see in Figure 2-1, in addition to stages, sleep also occurs in cycles. For eight hours sleep, this generally means five ninety-minute cycles, the last three somewhat shallower and longer. Each cycle consists of as many as four stages during which the mind “descends” into the depths of unconsciousness. When the mind ascends to near consciousness, we enter REM and dream. The length of time we spend in REM increases with each cycle. During each of the five periods of REM, we come close to being awake, and some of us may actually become fully awake and have difficulty getting back to sleep. One problem that can wake you out of REM is dry eyes. Some people have this problem every night. Remember that REM means rapid eye movement. If you have dry eyes, this eye movement can be painful, and it will wake you every time you enter REM. If you don’t do something about it immediately, you can’t get back to sleep either. Not only can it contribute to insomnia, it radically reduces the time you spend in REM and can adversely affect your physical and mental health. For those with this problem, I recommend having some form of eye drops, perhaps even an eye lubricant, on the night stand for handy access. I haven’t been able to find this connection between REM, dry eyes and insomnia in any book or article on sleep, or anywhere on the Internet. I have the problem. So could you. Medication can also potentially cause dry eyes, so be careful what you take. You may be worsening your insomnia. Sleep propensity diminishes as we sleep, so we naturally have less as the night goes on. If we wake at the end of a sleep cycle our sleep propensity is less than when we first got into bed, and we may have more difficulty getting back to sleep. Couple this with the fact that some of us have impaired sleep propensity curves because of repeated interruptions at a specific time, and you can have a rather severe problem. 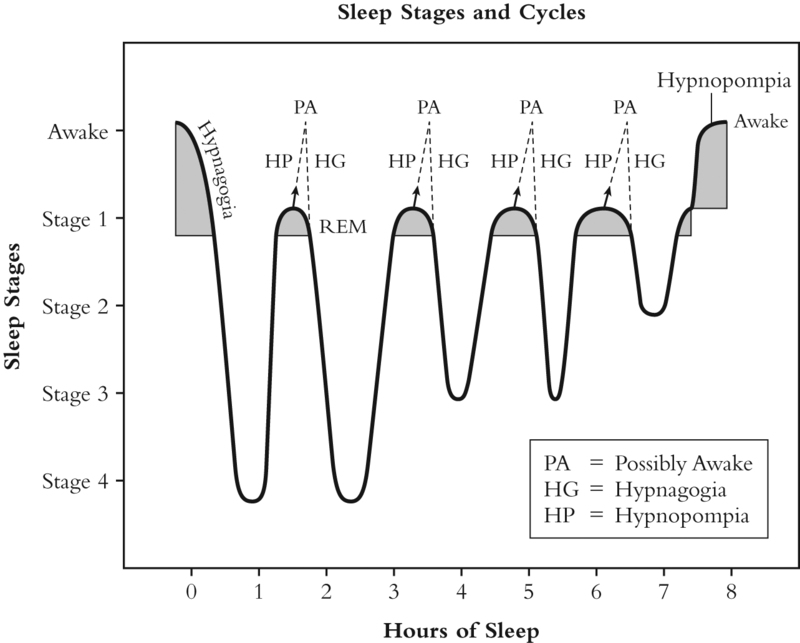 The dashed lines at the top of each cycle indicate that, if we do wake, we transition through hypnopompia as we do so and then also transition through hypnagogia as we return to sleep. Ordinarily, we should go through hypnagogia and hypnopompia only once each, hypnagogia in the evening and hypnopompia in the morning. That also means that during the night, and including the first time we go to sleep, we have five chances to mess up getting the rest we need to function efficiently the next day. The procedure we will use to get back to sleep may be needed five times each night. At the end of the fifth sleep cycle we do wake, our night is over, and it is time to get out of bed and get ready for the new day. First, we will concentrate on the first time we descend into sleep, although our return-to-sleep routine will be the same for each cycle, if needed. 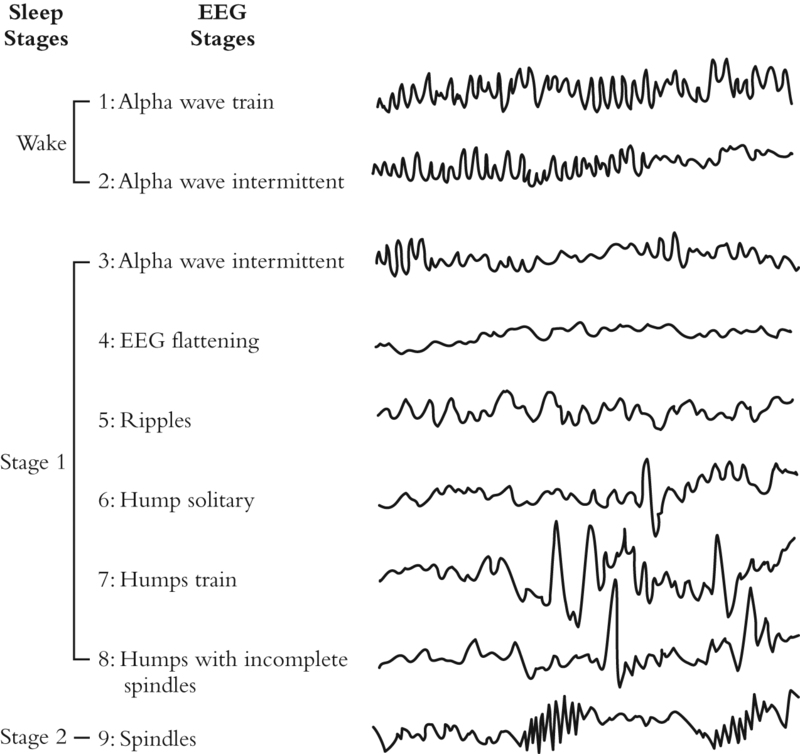 An example of EEG waveforms that occur during each stage of sleep is shown in Figure 2-2. These waveforms, which can be quite different, are provided just to let you know how sleep scientists define each stage. The waveforms are interesting but don’t point toward a solution for insomnia. Hypnagogia generally lasts only five minutes. Most of us experience hypnagogia as our wandering thoughts as we wait to fall asleep. We may have flashes of images or hear voices that are of no consequence and dismiss them. When we can not fall asleep, we start imagining conversations that become arguments, or we engage in endless fantasies or even try to solve a problem. This is where the trouble getting to sleep starts, and it can seem to go on for an eternity. If we wake during or after each cycle’s REM, we again have to go through hypnagogia to get back to sleep. You have probably never heard of hypnagogia even though we have known about it for over two thousand years. Aristotle wrote about it. Human beings have probably known about it for thousands of years before that, although not by that name. Dr. Andreas Mavromatis, who wrote the book (listed in the Bibliography) on hypnagogia, defines hypnagogic experiences as, “hallucinatory and quasi-hallucinatory events taking place in the intermediate state between wakefulness and sleep.” [page 3] If you would like to read about it as it shows up in literature, see the book by Peter Schwenger, At the Boarders of Sleep, also listed in the Bibliography. It is truly eyeopening. As we go along, we’ll investigate hypnagogia and how its characteristics might provide clues to help us get to sleep. Sleep professionals want you to create a good environment and physical state before you go to bed to help you get to sleep. This is called “sleep hygiene” and is good as far as it goes, but when you close your eyes, you are on your own. Plus, of course, they want you to take a pill because that is where they make their money. You can also wake up groggy the next day, and the long-term effects of the medications they prescribe can be moderate to severe and sometimes not known at all. The good news is that controlling your sleep-onset and sleep-maintenance mental processes is quite easy under normal circumstances, and hypnagogia is readily influenced. Some people find going to sleep initially easy enough only to wake completely after first REM, and subsequently, and are not able to negotiate hypnagogia successfully to enter the next sleep cycle. Plus medications are for sleep onset insomnia and not sleep maintenance insomnia, which occurs after REM. Hypnagogia has its seductive distractions that lead you astray. Nowhere is that fact more emphatically stated than in an article by Mircea Steriade titled, “Sleep Oscillations and PGO Waves” (2009), where Steriade states that during the preparatory state we “…display complex motor behaviors directed to find a safe home for sleep.” This search for a safe harbor indicates that the passageway to sleep is replete with obstacles that we should avoid. This makes it imperative that we learn as much as possible about hypnagogia, so we can solve the problem each time we encounter it. The strange thing is that, although hypnagogia has been studied, it is rarely, if ever, addressed when discussing insomnia. Yes, you read that right. When professionals deal with the problems of getting to sleep, they rarely if ever discuss the nature of the transition state and how to deal with it. Again, researchers are focused on the physics and chemistry of brain function during sleep because they are developing medication to put you in that state, and they specifically exclude the subjective personal experience of sleep onset, hypnagogia. So that is where we will start, with the initial mental processes involved in going to sleep. Hypnagogia is really interesting. So is the method for getting yourself through it and to sleep quickly when you ordinarily would have stayed awake for hours. But before we get to the solution, you must understand hypnagogia. It has its uses but also a multitude of distractions that can lead you down the wrong path. In other words, hypnagogia is not just a steep slope you slide down to “fall” asleep. Indeed, it is more like a battlefield, a psychiatrist’s couch, a mad scientist’s laboratory, a movie theater, and the oracle at Delphi all rolled into one. Insomniacs generally experience it as the mind racing as it tries to solve a problem, engages in an imaginary argument or some out-of-control fantasy. The mind will just not stay quiet and “fall” asleep. Efforts to quieten our thoughts work for a bit but ultimately fail. And the problem is the very nature of hypnagogia. …spontaneously appearing visual, auditory, and kinesthetic images; qualitatively unusual thought processes and verbal constructions… Additionally, specific physiological indexes have been observed in conjunction with these phenomena: A slowing of frequency and depression of amplitude of the electroencephalogram (EEC) and the appearance of slow eye movements… and recent studies suggest that… changes in respiratory patterns may accompany the above psychological phenomena. Hypnagogic images are consistently more real than dream images and even our view of the real world. One subject relates that, “The faces I see are more vivid than nature . . . absolutely full of life and movement . . . always possess vividness of expression.” [Schacter, page 461] The images associated with hypnagogia can take many forms, including geometric symbols, faces, or landscapes. Most anything, actually. And as Dr. Schacter says, it is not just images. Sounds and physiological phenomena also occur. If these hypnagogic experiences are so profound, why isn’t everyone talking about them? The answer to this frequently asked question is that the more spectacular phenomena can require a certain “power of observation” to notice them. In other words, some of us have to be actively looking and listening to observe them, yet even if not noticed, they are still there and cause problems trying to get to sleep. Some find them easier to locate than do others. I wasn’t aware of any hypnagogic occurrences until I started practicing Jung’s active imagination (defined later). I then realized I had experienced them many times through the years and started seeing and hearing all sorts of visions and voices just before sleep. Even though we might not be aware of hypnogogic events, they are the background cauldrons of emotional activity that pull us off the beaten path to sleep. The intellect is still functional during this time and can be directed to monitor the psychic phenomena associated with hypnagogia. In those who do actually descend fully into sleep, the intellect succumbs to drowsiness and slips through hypnagogia quickly, perhaps not even noticing anything unusual. If you slow down the process and take notice, you quickly learn that a lot more is going on inside your own mind than you would have ever thought. And what you have unconsciously done has produced your insomnia. You have slowed hypnagogia and made use of some of its remarkable characteristics that are helpful in certain situations but certainly not when you want to get to sleep. The nine different waveforms obtained during this research are shown in Figure 2-3. We won’t go into the technical description of these nine waveforms; however, the subjective hypnagogic experiences described by individuals will give us some clues to the nature of the mental processes during these wave states. More specifically, in this study, from hypnagogia Stage 1 to Stage 9 (being awake to being asleep), visual images comprised as much as 91 percent (increasing toward sleep) of the hypnagogic experiences; auditory experiences constituted as much as 12 percent (decreasing toward sleep), and as much as 13 percent for the other senses. All the senses could be present: sight, sound, touch, taste, and smell. From this we see that sight (images) was by far the most prevalent hypnagogic experience with sound (auditory) coming in a distant second. What should you take away from all this research data? Three things: First, we have control of hypnagogia initially but lose more and more control the closer we get to sleep. Second, to control hypnagogia we need to concentrate primarily on visual experiences but also sounds with the other senses playing a diminishing role. Finally, since all five psychic senses show up in hypnagogia, we essentially are dealing with what we might call our psychic body. What we need to do with this psychic body is to find a way of controlling and directing it away from the distractions of hypnagogia, primarily through the use of images. This is an important conclusion, and we will definitely use it as a part of our solution. Even if what we have uncovered about hypnagogia so far can lead us toward a solution, we still have not learned why it is such a problem. The question is: Why should the processes of sleep onset be so detrimental to getting to sleep? That seems contradictory. Here is the reason: Hypnagogia is inspirational. The hypnagogic state has been used for hundreds and possibly thousands of years by our most brilliant minds: artists, scientific professionals, inventors and psychics, and their experiences shed light on what is so distracting about this pre-sleep state that diverts our attention away from going to sleep. As a matter of fact, hypnagogia is what puts the genius in geniuses. However, these distracting influences aren’t peculiar to geniuses. Everyone is subject to the same influences. Here are the predominant activities that are intensified during hypnagogia. Keep in mind that some activities are immediately available and others are more remote and difficult to get to. Still, hypnagogia can capture your thought processes and use them to its own advantage if you are lying around waiting for sleep to come to you. With each of these processes come images, sounds (sometimes voices), and triggers for the other three senses as well. Your thoughts provide a background for augmenting the hypnagogic processes. One of the more important aspects of hypnagogia is that it is a great problem-solving state, and because of this, your brain can latch onto a problem from your daily life and delve into finding a solution while trying to negotiate hypnagogia. It can be solving a math problem, a financial difficulty, or working out a new floor plan for a home. Of course, you have gone to bed to sleep, not solve problems. Hypnagogia has hijacked the brain’s normal processes and led it astray. Your thought processes have become the enemy. And it is not the bad side of you — that complacent, lazy person who ignores problems. It is your better angels, the conscientious part that is always trying to solve problems. Shutting this off can be difficult if you don’t know how. You have gone to bed to get some much-needed sleep but can’t shut off the internal dialogue. Your mind races with what seems important thoughts, but then you realize that nothing is more important than getting a few hours sleep. The solution is to shove these thoughts into the background where they will rapidly dissipate, and it is much easier than you might think. And no, it isn’t a meditation technique intended to cleans the mind of thoughts. A predetermined ritual that will lead us to sleep can resolve these difficulties. Your task will be to redirect your brain’s activity away from the hypnagogic problem-solving processes. Another of the difficulties is that hypnagogia is really good at working with internal conflict. Frequently, this comes in the form of an imagined argument with someone. These quarrels can get passionate enough that they go on for hours morphing from one heated exchange to another. Furthermore, Carl Gustav Jung, the father of analytical psychology, developed a technique that uses the initial states of hypnagogia for solving internal conflicts. He called the technique “active imagination.” The patient, before practicing active imagination, identifies a problem s/he wants to probe and then goes to a predetermined psychic location imagined specifically for active imagination, and there the patient encounters autonomous psychic entities that s/he engages in conversation concerning the problem. Active imagination is sort of a controlled conflict resolution process. This technique puts hypnagogia into suspended animation and enables the patient to stay there for a considerable period of time, provided of course the patient doesn’t slip into the downward spiral of drowsiness and go to sleep. If you are in therapeutic mode, you have actively blocked your path into Slumberland. Thomas Edison used it for coming up with ideas for his inventions. August Kekule had the inspiration that the structure of benzene was a closed ring while half-asleep before a fire. Hypnagogia then becomes the scientist’s laboratory where s/he tries on ideas and invents things. This is a really exciting state but disturbingly distracting when trying to get to sleep. We also tell ourselves stories while in hypnagogia and have all sorts of fantasies. Mary Shelley was in such a state when she came up with the idea for her novel Frankenstein. Mary spent the evening with her lover, Percy Shelley, as well as the poet Lord Byron, Claire Claremont and Dr. John Polidori, all discussing electricity and the regeneration of dead tissue. This provided the background for her hypnagogic experience once she went to bed. And yes, her experience came in the form of an image of a monster created by a man. Today many authors use it for creative writing. We have problems getting to sleep when we fantasize along some favorite theme. Nothing provides more of a distraction when trying to go to sleep than a strong sense of guilt and the frustration of having passed up an opportunity to accomplish something crucial to our happiness. Guilt can come in many forms, e.g., something cruel said or done to a loved one or having offended a colleague at work. Similarly, a lost opportunity can involve a potential love interest not pursued or a business venture we were too conservative to venture into. Life is filled with many roads not taken, and with hindsight, we can be full of regret that surfaces at bedtime. This sort of worrying can become emotionally inflated in hypnagogia and cause psychic damage. Focusing on these emotional issues can not only keep us awake but also cause emotional instability. Finally, we come to hypnagogia’s counterpart to the oracle at Delphi. The auditory aspects of hypnagogia can seem to come from someone other than ourselves. It may seem that we are channeling a “voice from beyond.” Hypnagogic imagery can appear to not be a part of the mind’s processes. The images seem to come from “out there,” even perhaps from an alien world. We see faces of people we have never known, some of them frightening, and we see scenes from worlds we have never visited. Some of the beings we meet appear to be from the Spirit World and may even provide religious revelations. Mystics describe it as “a universe endowed with a perfectly ‘objective’ existence and perceived precisely through the Imagination.” [Corbin, page 3] One could very well imagine that St. John while in exile on Patmos used such an inspirational state to write Revelation. The mind generally deals with these images and voices by invalidating them. “They are just the mindless ramblings of untethered thought processes,” is the normal response. But if you take them seriously and focus on them, they can be profoundly interesting, and that interest can stall out the going-to-sleep process. Since hypnagogia is useful for a multitude of activities, and probably more than I have listed here, it is easy to see how it can delay going to sleep, perhaps for hours. If you do this for a few nights in a row, it affects your sleep propensity curve, and once out of balance, you can have a lot of trouble putting it back where it should be. Hypnagogia is habit forming, and once you get a taste of it, it is difficult to walk past on your way to something as boring as sleep. If getting to sleep is your priority, getting through hypnagogia quickly is your goal. Hypnagogia is highly directable, and some people have taught themselves, either through unconscious trial and error, or by stumbling onto a solution that works for them, to get through hypnagogia quickly. You might expect that after making such an observation the next subject would be about how these “habitual nappers” accomplish this feat that all insomniacs would pay good money to know. Ogilvie does not, and we are all left in the dark concerning their solutions. But this statement does let us know that a method for falling asleep does exist, and this means that it is possible to direct our mental process toward sleep. If others have learned to do it, so can we. Now it is time to learn how to find a path through hypnagogia into Slumberland.